Is the Seated Cable Row Right for You? Sit on the bench attached to the cable row station and place your feet into the fixed position foot plate. 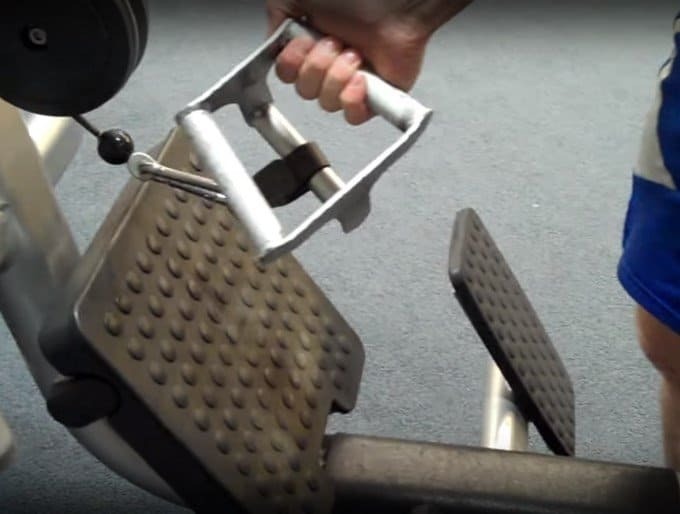 Flex the knees and wrap both hands firmly around your chosen handle attachment. Slightly extend the upper body until the lumbar spine is in a neutral lordotic position and the arms are outstretched with the hands lined up with the base of the sternum (xiphoid process). Actively brace the core, paying extra focus on pushing the diaphragm as well as the obliques OUT. Aggressively drive the shoulder blades together to keep the upper arm purposefully set back into the glenohumeral joint (shoulder capsule). Orient the eyes to a focal point directly in front of you so that you keep a neutral cervical spine. You should only look like this when initially setting up the starting position, or putting the weight down after a set. If you look like this at the end of each eccentric rep, the weight is way too heavy! Maintain a strong, rigid torso. Bend your knees slightly so your hamstrings aren't overly tight. Make sure you keep your knees bent at this angle throughout the set. Don't cheat by extending your knees for momentum. Aggressively pull and tuck the elbows, guiding the attachment handle to an area between the base of your sternum and belly button. Using a little more trunk extension is okay as long as you are not compromising your postural position (i.e. don't go into lumbar hyperextension or hyperflexion). Try to maintain a slight bend in the knees to keep some slack in the hamstrings. Draw the handle in toward any point between you navel and just below your sternum; I personally prefer pulling to navel level, as is shown above. Focus on pulling back from your elbows and upper arms, as this will help you to pull more with your back muscles than with your biceps. Once the cable row attachment reaches your body, focus on actively driving the shoulder blades together and depressing them down into the lats to maximize tension. The entire shoulder girdle should shift back; if the shoulder joint is in front of the elbow from a side view, you're doing it wrong. Note how the shoulder blades are pulled together and the mid-back muscles are squeezed tightly at the top of the motion. Continue to maintain your postural position. With slow deliberate control, guide the cable attachment back to the starting position. Do not just relax and let the cable pull you back to the initial position. Allow your shoulder blades slide forward over your ribcage somewhat. You should feel a decent stretch on your lats and midback. You should not let them come so far forward that the weight is pulling directly on your shoulder joint/connective tissue, or causing your torso to lean to far forward. Once the bar has settled motionless in the bottom position, continue to execute the desired number of reps.
Lower the weight being used and focus on getting the cable row attachment all the way to your body. Pay attention to your elbow position. Try to imagine guiding the resistance with your elbows and not just pulling it with your hands. Too much “pulling” will result in a greater degree of elbow flexion and won’t optimally hit the lats. During the eccentric phase, make sure to keep your shoulder blades actively retracted and slow deliberately slow down the cable attachments return to the start position. Slight deviations in trunk flexion and extension is acceptable. As soon as you notice you are losing postural control or having significant forward and backward trunk movement, then you need to lower the weight and focus on more controlled movements. A little bit of "trunk English" (i.e. slight momentum from torso) is okay. But, you should never lose your neutral lordotic position in your lower back — keep your pelvis neutral and your lower back will follow. Squeeze the lats hard at the midpoint of the exercise by driving the shoulder blades together and depressing them down. Keep a slight bend in your knees. Always be in control of the eccentric movement. The position required to effectively execute the seated row exercise requires almost zero learning curve. As such, this is an excellent exercise for beginners and experts alike. Beginners can use it to focus on postural control while rowing, which will transfer to numerous other exercises. Experts are going to only be limited by their imaginations with the almost infinite variations this exercise is capable of. Changing hand positions, foot positions, handle attachments, using one versus two hands, etc. will all change up the leverages and moment arms of the exercise to keep it from getting boring and keep the gains coming once you’ve adapted to a certain variation.